Page updated 9 April 2019. Click your browser’s Refresh button to ensure you get the latest information. The EMDR Assn of Australia Accredited Basic Training consists of three components: an Introductory Workshop (sometimes called Level 1 or Weekend 1), an Advanced Workshop (sometimes called Level 2 or Weekend 2) and 10 hours of Case Consultation (supervision). You can register for any of these components on their own, or register for the EMDR Comprehensive training which covers all three. Either individually or as part of the Comprehensive training, the workshops are the same. Both the Introductory and Advanced workshops as stand-alone workshops include six weeks access to Case Consultation. The EMDR Comprehensive package includes unlimited Case Consultation from when you start training until 12 months after you have completed the Advanced Workshop. The Comprehensive package also give you includes heavily discounted fees for Master Class webinars and workshops. You have 2 years after the Introductory Workshop to register (at no additional fee) for the Advanced Workshop. Both workshops emphasise experiential skills development. You must complete the didactic knowledge component of each training prior to attending the workshop. This consists of a program of reading, recordings and videos which will be sent to you upon registration. For the Introductory Workshop allow 10 hours, allow 8 hours for the Advanced Workshop. Regular Q&A sessions are held via Internet meetings to assist you in covering this material. If you have registered and attended an Introductory training and wish to upgrade to the full Comprehensive package, Click here. Detailed Training Outline, Click here. Sign up for any Introductory Workshop and take the Comprehensive Training fee option. You can take any Advanced EMDR Workshop for a 2 year period after you have completed your Introductory Workshop and have had some clinical experience of using EMDR (Minimum 5 clients / 12 sessions) and some Case Consultation sessions (CC). You then select the Advanced Workshop you want and register below, using 100% discount code that we supply, so you pay nothing. Most people are ready to take the Advanced Workshop within 3 months of doing the Introductory Workshop. See this page http://therapist-training.com.au/workshop-support/ for details of Pre-workshop Q&A and Post-workshop CC sessions. Adelaide 14 – 16 March 2019. Rydges Hotel, South Tce. COMPLETED. Melbourne 17 – 19 March 2019. Treacy Centre, Parkville. COMPLETED . Perth 28 – 30 March 2019. Piney Lakes Centre, Murdoch. COMPLETED . Sydney 28 – 30 June 2019. Rydges Hotel, Missenden Road, Camperdown. Click here to register. Melbourne 21 – 23 June 2019. Treacy Centre, Parkville. Click here to register. Brisbane 12 – 14 July 2019. George William Hotel George St. Click here to register. Sydney 20 – 22 September 2019. Rydges Hotel, Missenden Road, Camperdown. Click here to register. Melbourne 13 – 15 September 2019. Treacy Centre, Parkville. Click here to register. Adelaide 8 – 10 August 2019.. Rydges Hotel, South Tce. Click here to register. Perth 31 Oct – 2 Nov 2019. Piney Lakes Environmental Centre, Murdoch. Click here to register. If you completed the Introductory Workshop and wish to upgrade to the Comprehensive package, click here. This give you unlimited access to Case Consultation for 12 months beyond your attendance at the Advanced EMDR Workshop, and free access to advanced webinars. To attend this training you must have attended an EMDR Australia Accredited Level 1 training, had clinical experience with a minimum of 6 clients, and had some Case Consultation with an EMDR Australia Accredited Consultant. The Advanced Workshop goes well beyond the curriculum requirements of EMDRAA. You will practice advanced resourcing strategies and variations on the standard protocol for clients who are emotionally dysregulated, dissociative, have a personality disorder or an attachment disorder. If you did your Introductory (Weekend One) training with another accredited EMDR trainer, we provide a bridging program to cover material covered in our Introductory Workshop but not covered in other trainings. Access to preworkshop Q&A sessions and post-workshop consultation sessions is included in the fee. Perth 12 – 13 April 2019. Pinney Lakes Environment Center, Winthrop. Click here to register. Brisbane 8 – 9 July 2019. George Williams Hotel, George St. Click here to register. Adelaide 12 – 13 August. Rydges Hotel, South Tce. Click here to register. Sydney 23 – 24 September 2019. Rydges, Missenden Road,Camperdown. Click here to register. Melbourne 16 – 17 Sept 2019. Treacy Center, Parkville . Click here to register. Perth 8 – 9 November 2019. Piney Lakes Enviroment Centre, Murdoch. Click here to register. After both the Introductory and Advanced Workshops you have the opportunity to bring clinical questions to small group Case Consultation sessions, held via Internet meetings. If you registered for the Comprehensive package, you have unlimited access from the Introductory training for up to 12 months after your Advanced training. If you registered for just the Introductory or Advanced workshops as stand-alone trainings you have access for 6 weeks after each workshop. If you haven’t done either of my trainings, but just wish to have Case Consultation, you can purchase a 5 session package valid for 6 months for $350, or a 10 session package valid for 12 months for $500. Click her to register. This is designed for rural and remote based therapists who cannot attend a city-based training. 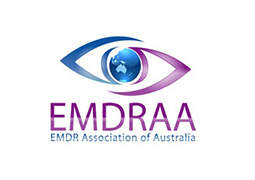 All EMDR trainings listed here are accredited by the EMDR Association of Australia.